"The idea for the clawshot came after seeing Amouranth’s Green Tunic Link cosplay. She built the Iron Boots as one of her props, which ended up giving me the idea. What else could be built from Twilight Princess? The clawshot seemed kind of plausible. It was one of my favorite props from the game. And so began my first Pepakura project...."
Jindrax has the Pepekura file hosted on his website. "I currently have it set for a person of 6’0” in height (Clawshot Length Tip to Cuff: 19”). You can change this up or down a bit depending on your own height." 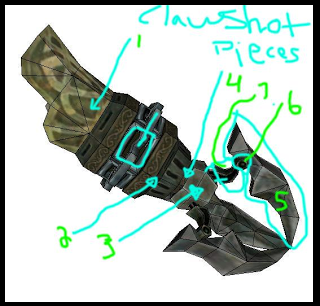 "I left all of the parts in case someone would like to take a slightly different approach to assemble [the clawshot.] I didn’t use the handle and the inner chain that is hidden by the housing." Inner-Hexagon-Thing-That-Has-Chains-On-It: "After folding and gluing, I put a few supports on the Inner-Hexagon-Thing-That-Has-Chains-On-It to help keep it stable. [This method] prevents warping. I would also suggest a bit of fiberglass cloth sprayed glue and then saturate it with resin to help add durability. I cut the shape of the hexagon thing into the housings and then spot glued them to hold them in one piece while reinforcing." Claws: "The claws are fairly small when folded. They still can be reinforced but it takes a lot of patience. I mainly used Rondo (Bondo and Polyester Resin, mixed 1:1, activated with Bondo Cream Hardener) to reinforce my clawshot." Claw to Claw-Mount-Thingie: "I made the original Pepakura pieces tough enough to withstand being molded. There is not a good way to reinforce them to withstand the necessary stress of the claw. I then pulled three copies of the Claw to Claw-Mount-Thingie and epoxied a thread rod into the claw and into the Thing to keep it secured." Handle: "The handle is part of the internal framework to tie all of the pieces together. I used a square dowel rod and made a rectangle without one side and pushed it through the assembled housing and epoxied it. There is another piece of dowel rod that is glued to the bottom of the housing and runs up through the claw mount to secure it." Detailing: "The small details on the copper pieces are done with a bit of Apoxie Sculpt. I used spray paint for the various metal colors. I mixed up some browns with acrylic paint to do the dirt on the copper pieces and the design on the cuff."